Crust missed the Fetlar edge rule in the Berserk game, so it is added. All Fetlar rules are integrated in the Berserk. If white looses the knight, which can easily happen, and black looses the chieftains, it is all pure Fetlar (except that the king can still jump to and from the king's squares, and except for the berserk moves). Beyond, it seems to me that the berserk variant is in some way a totally different kind of hnefatafl. It's the fact that white has only one knight whose position isn't exchangeable. This means it's no longer the same from where both colours start on the board! And yet there's no realistic chance for white to force a draw, it must mobilise its knight as soon as possible (or as profitable as possible) to break free – wouldn't everything else be unwise?. I would love it if the historic sources would have given us one knight on BOTH flanks, this would be more tafl-like as we know it. The game's full of surprising moments and intriguing options, however. When you take a close look at the defenders, you'll discover one the them has a nail hole in the top (besides the king). Not more than one piece; something was mounted there, some top decoration. Another defender has an unregular hollow on the side near the top, but this looks much more like a cast fault. By the way also the king seems to have a nail hole in the top, larger than the first one, like some even larger decoration was mounted on top of this piece. On the four attacking commanders a top decoration is preserved; on rest of the attackers: no sign of such. Apparently the manufactoring approach of this glass artist consistently was to mount tops with the use of nail holes. So, no sign of the defenders having more than one officer piece besides the king. In return this one piece should be expected to have some abilities which are nasty to the attackers. The historic sources on the game rules, I've suggested for this set of pieces, are the Fetlar game, which is in itself a distillation of all known historic tafl games, plus all descriptions of other known games of the Latrunculi family found in R.C. Bell: "Board and Table Games from Many Civilizations". All the game piece move patterns known from these games were transferred and integrated in the suggested Berserk rules by, if I may be so bold, "educated guesses" (which is very different from pure guessing...). Noone rule was introduced which is not already known from one of these games. The suggested move pattern for the knight does make this piece nasty to the attackers; the only piece on board killing enemies all alone, with no help from comrades or king's squares. The move pattern looks like the behaviour of a warrior on horseback - the knight jumping over enemies with his horse and killing them off. After a number of test games with the suggested rules, it seems impossible for the defenders to build a draw fort with any commanders alive, and it also seems impossible for the attackers to seal off the corners with the knight still alive. By the way, while I think "the knight" is a suitable name for the king's officer, probably a better name could be found for the attacker commanders. Commanders, chieftains, hersir. The commander is probably the head of one Viking war ship with crew and warriors. I wonder what their real name was in Viking Age? Note that none of the four attacker commanders' top decorations have fallen off, whereas both defending officers' decorations are missing, left only the empty nail holes. This suggests that "the king"'s and "the knight"'s decorations were both larger and thus easier broken off - could maybe be some sort of a crown on top of the king, and who knows if "the knight" might've had some sort of a horse head decoration on top - ? Last edited by Hagbard on Sat Dec 17, 2016 11:25 am, edited 2 times in total. Do we have a win/loose-overview for the berserk-games played so far? I can't get rid off the feeling that white in Berserk is too weak ... could the edge-rule be too hard? @ Hagbard: Those games were amazing! Lot of fun and always exciting. Still, I've got problems with my small laptop, the chat window won't appear. Roderich wrote: Do we have a win/loose-overview for the berserk-games played so far? I can't get rid off the feeling that white in Berserk is too weak ... could the edge-rule be too hard? At the moment, from 34 Berserk games and 10 players, the statistics is 19 white wins, 12 black wins and 3 draws. But let's keep an eye on whether the edge rule is too hard for white. Roderich wrote: Still, I've got problems with my small laptop, the chat window won't appear. I wrote a note about it today on the small forum. Evaluation of the Berserk test tournament October-November 2012.
white (defenders) 18 wins, black (attackers) 23 wins, 1 draw. So the balance seems fine. I would say that the rules worked well, the game dynamics made sense and had in it often much drama. From the experience with the tournament I would suggest one tiny rule change. 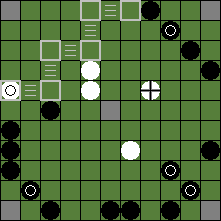 In each and every other variant, be it Hnefatafl or Tablut variants, be it king captured from 2 sides or from 4 sides, king armed or unarmed, board size 9x9 or 11x11, in all variants the rule for capturing the king in the board center is the same: On the throne the king must always be surrounded by 4 attackers, and next to the throne by 3 attackers. So the Berserk Hnefatafl should not be the only exception to this general rule. The Berserk game balance is not affected by this change. Only in 2 of 90 tournament games was the king captured in the board center by commanders; in both cases by a commander against the throne, and in both cases black would've won anyway. After the tournament I think I understand a bit better how this general center rule contributes to the game dynamics. In a capture-from-2-sides game it has the effect of making the center more comfortable to the king, so that the king is set in a dilemma of following a temptation to stay in center in relative safety, or to leave off into the uncertain dangers in the open field. The risk is that the king waits too long to leave and ends up surrounded in center and loses. So, the Berserk king is captured from 4 sides the same way as in Fetlar, and additionally the viking commanders capture him the same way the king is captured in a capture-from-2-sides game. (The software is not changed yet while the last of the tournament games are still in progress). Last edited by Hagbard on Thu Mar 02, 2017 9:35 pm, edited 1 time in total. I really enjoyed this berserk hnefatafl although I found it hard to get use to the berserk rule. Lots of fun (and drama)! @Hagbard: your suggestion makes sense for all three reasons you give; I support this change of rule. Fraech wrote: @Hagbard: your suggestion makes sense for all three reasons you give; I support this change of rule. Yes, me too. thank you Hagbard for your very clear explanation. I'm very glad the figures so far look promising for Berserk's game balance. It is certainly a very enjoyable variant, with its combination of two-side and four-side capturing. Fraech wrote: I found it hard to get use to the berserk rule. I had the same problem as Fraech. 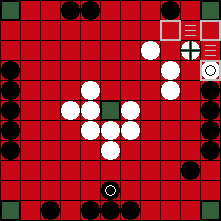 The berserk multi-capture rule seems to work mostly in black's favour, but probably only because I'm leaving several white soldiers en prise which is good tactics in Fetlar and Copenhagen but pretty useless in Berserk - the "millar gambit" for instance is much less powerful, possibly I need a total re-think of tactics, especially openings. It's interesting that a single "commander" on c3 can effectively block the king from getting into a1 from either direction. Incidentally, I was wondering what you thought of calling the king's knight the Queen. Seems logical as the king's companion, and the piece has a similar combination of strength and vulnerablility you find in the chess queen, which means you try and protect it during the early game for use in the middle or end game. Just a thought. crust wrote: Incidentally, I was wondering what you thought of calling the king's knight the Queen. Seems logical as the king's companion, and the piece has a similar combination of strength and vulnerablility you find in the chess queen, which means you try and protect it during the early game for use in the middle or end game. Just a thought. A lady on the men's battlefield? The mentioned similarities are there (king's companion, combination of strength and vulnerablility, protect during the early game for use in the middle or end game), but the movements of the piece are those of a knight on horseback - it jumps and runs and kills everybody on its way.